There is a good reason for the surge in popularity of education loans in India. With the cost of education constantly on the rise, it has become nearly impossible for middle-class families to afford higher education for their children without access to external funding. Education loans are the easiest and most accessible source of such external funding and enable students from all walks of life to pursue higher education in the institutions and courses of their choice, be it in India or abroad. Benefits on Education Loan are not only limited to financial freedom but Tax benefits on Interest as well. WHO ARE COVERED – Under Section 80E of the Income Tax Act, 1961, an individual can avail of tax benefit if he/she has taken an education loan to support higher studies of self, spouse, children or for the student of he/she is the legal guardian. Thus, a study loan if taken for siblings or other relatives, does not attract any benefits under the section. 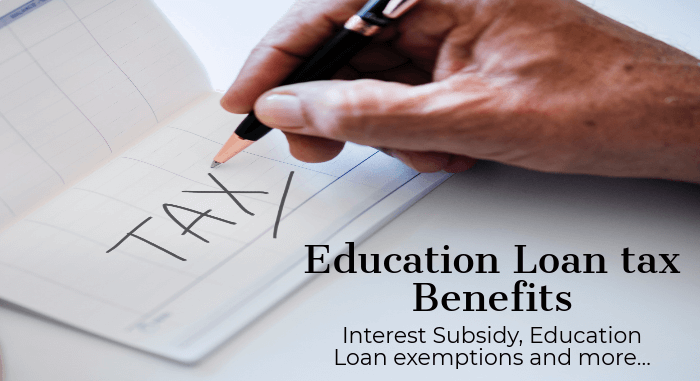 ONLY THE INTEREST – Also note that the income tax benefits on education loan can only be claimed on the interest part of the loan. The principal part does not qualify for tax benefit. NO UPPER LIMIT – There is no upper limit for the total deduction or the rate of interest. Hence, the entire interest part of the loans repaid can be deducted while calculating your taxable income. IN WHOSE NAME – Remember, the deduction can be claimed by an individual only if the loan has been taken in his/her name. So if the loan is in the name of your parent/s, you cannot claim the deduction on your income. STUDY ABROAD LOANS – There is no distinction made under the section for education loans taken for studies in India or abroad, hence, you can claim the deduction even for an education loan availed for studying abroad. COURSES COVERED – The section covers all fields of studies, including vocational studies, for higher education. Previously deduction was available only for pursuing full-time studies for any graduate or post-graduate course. Even the courses were limited to engineering, medicine, management or for post-graduate course in applied sciences or pure sciences. Now this section covers a wider bandwidth of courses. TIME PERIOD – From the time you start the repayment up till complete repayment or a period of 8 years. Hence, if your repayment period is longer than 8 years, the deduction will be valid only till year 8. If you if you repay the loan within 5 years, you can claim a deduction only till such period. APPROVED INSTITUTIONS – The most important thing to note about the tax deduction is that the benefits on education loan is applicable only if the education loan has been availed from any bank, notified financial institution, or an approved charitable institution. No other loans, whether taken from an employer, family, or friends, are covered under the benefits of section 80E. EduLoan insight: Remember to inform your company’s accounts department about your Education Loan. This ensures that your tax deducted at source (TDS) takes the loan interest into account. You can always claim a refund after you file your tax returns at the end of the financial year.